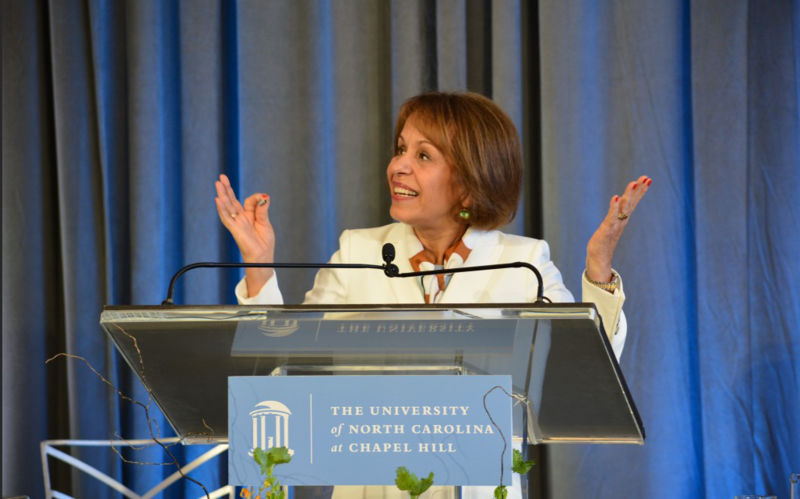 WCHL news director Blake Hodge spoke with UNC Chancellor Carol Folt on Tuesday about her decision to step down, the current state of campus security and the impact that she made on the community during her time in Chapel Hill. Q: You made the announcement, two announcements, on Monday that you would be stepping down at the end of the semester and then ordering the removal of the remnants of Silent Sam. Can you walk us through maybe the last 24 hours or so of leading up to that decision and what was weighing on your mind? A: That’s kind of a big one. Let me try to figure out how to break that down into a couple pieces. But I had been working on all these things for many times. I’ve been thinking about my own path forward and in some ways these are very separate for me. What I do as the chancellor and running the university and working with students and leading the campaign and all those things have been very much a part of my thought about my future. I spent the holiday with my family, we talked about a lot of things like that and I felt pretty certain that I needed to make that decision that I decided that 2019 was the time for me to move to my next and that I thought that with all the momentum going here, it would be excellent for the new chancellor, so that was going on in my mind. I’ve also been very concerned about public safety, as you know. Over the holiday, it was a chance when we weren’t having the issues of safety so directly for all of us to think about it. I had the report from the safety panel that led us to understand fully the real risks and stresses to a campus that is under constant threat of disruption and some of those could be very dangerous. We had talked quite a bit about what the options were for me going forward and I decided when I returned that I would exercise my option as the person in charge of public safety on the campus to remove the base and the commemorative tablets to a safe and secure location. I think it will be very helpful for the campus because I think now the campus can feel safer. We can go about the business of this university, which is very important and it does give probably more space for the Board of Governors as they go through their own deliberations about what they believe should take place. Q: You’ve mentioned the desire that [Silent Sam] be moved off campus repeatedly whenever we’re having this, but the legal groundwork wasn’t there for that. Has that changed in your mind or you just feel that the report from the public safety panel that you referenced was enough initiative for you to be able to legally make this move? A: Well, I think there’s two very different questions. One is legally removing an intact monument, which I don’t have. This is not an intact monument. These are pieces of a monument that no longer exists. So that’s one thing. I’m not destroying them. I moved them to a secure location, but I do think that we have much better and fuller understanding of the public safety risk. And so I’m making this decision based under my authority as chancellor to really take responsibility for campus security. So I think these are a bit different. I think the circumstances really changed when it wasn’t an intact monument and I think it also changed when we had much more data in hand. And then when I returned I found that it was also continuing, it wasn’t going to be abating and a lot of that activity was taking place right around those artifacts. So I think it was important to do. They are securely placed right now and it was done very carefully and very professionally. And I think we did it in the right speed because we’re able to go on about the business of the university at the start of the term. Q: You talked about a lot of the accomplishments over your six years as chancellor of UNC. Do you feel like it is in a healthy place right now in terms of the work that has been able to go on, the monument now being gone, but also there’s obvious pressure coming from the Board of Governors that has drawn some criticism kind of nationally in academic circles? A: Well, I think there’s a couple of different ways to answer it. When you go back to just the business of the university, every single one of our metrics is as high as it’s ever been. More applications than ever, our faculty are fifth highest in research ,over a billion dollars. All of that has increased substantially in the last five years. We’ve seen our alumni meet the call for philanthropy in an unprecedented way. Last year we were over $600,000,000. So we’re more than halfway to our campaign. And what I know, that everybody else doesn’t know, is the nature of the things going on, the kind of exciting research here, people are going to be coming up with cures and changing the world. The curriculum that’s being offered in these schools is going to be really exciting. So if you’re looking for a new chancellor that wants to come to a great institution that is still on the way up, this is a wonderful, wonderful opportunity. And it’s the kind of moment that a transition makes sense. The next person comes in, they take this momentum and they do that for the next five or six years. It makes sense in that way. All of higher education is in a different place than they were 10 years ago. There’s much more tension at every school. We are dealing with our governance structures, we’re dealing with political systems, we’ve got sexual assault issues, we’ve got changes in the way we run our athletics programs. I mean everything is different. So universities need to be aware of all that too. And what we need to do is run great universities in the face of that kind of pressure and find a way to do it well. I don’t think you’re ever going to say to a new chancellor, there’s not going to be controversy, because the normal is that there will be. But are you prepared to do it? Do you have the right people in place is always the bigger question and it’s never just unequivocal, everything’s fine, that wouldn’t be realistic. But I think this institution is a great one and I think it’s in really good shape with what we’re doing on campus. Q: Is there a message to the campus or the Chapel Hill community at large that we haven’t been able to talk about yet that you would like to share? A: Thank you for saying that. You know, one of the reasons I think UNC – Chapel Hill so good is because of their relationships with the community. Thank you for reminding me that that’s part of what I think has really been important. Chapel Hill and the surrounding towns are all very interdependent, but you know that all the things that are happening on Franklin Street, we’ve made amazing partnerships with the mayor, we have done more building down there, that is a dynamic, an incredibly dynamic place. I started four new vice chancellorships in the time I was here and one of them was the whole community relations and communications group. It used to be all combined in one. That group is now very, very effective and I think we’re poised to do a lot more with our community in that way. Then we have all the outreach through the hospitals, we have a new chancellorship in development, we have a new chancellorship working with government relations and we have a chance to really work on entrepreneurship. When I came here, one of the very first things I did was authorize spending for the work together in the Northside community. And I’m going to always feel so privileged to have been in the position to make that decision. That was an example. I also made the decision to get going on Carolina Square to build Current. And also I was able to put in place the money to support the Men’s Center. So every time we get to do that and then we do it in partnership with our local relations, we do something really special. So thank you. That, I do think, is what makes it a great place to live is that you have a great university embedded within a great community.